Sayadaw Bhaddanta Kaythawa was born on Monday, the 2nd waxing day of Taboung in 1300 of the Burmese calendar year ( March 6th 1939) to U Hnyum and Daw Dwe from The Su Village, Winndwin Township, Mandalay Division, Burma (Myanmar).He obtained Samanera (Novice) at the age of thirteen, under the preceptor-ship ofVenerable Bhaddanta Thawmana Abbot of Kyaungthit Monastery. And later ordained as a monk at the same monastery. His supporters of the four requisites were U Bo Thwe and Daw Mya. He studied Buddhist scriptures under Kyaungthit Sayadaw of Winndwinn, Set Oo Sayadaw of Meikhtilar, Wai Pon La Sayadaw of Meikhtilar, and Bingalar Sayadaw of Yangon. He also contributed by teaching Buddhist scriptures while he was in Set Oo Monastery of Meikhtila, Bingalar monastery of Yangon and Aye Nyein Chantha Dhamma Yeiktha of Yangon. In August 1st 1978, he came to the United States along with Taung Pulu Sayadawgyi U Nandeeya and stayed back to further his studies as well as to teach the Burmese religious scriptures. Since 1991, he has been resident Abbot of the Bur-mese Buddhist Temple in Chicago. He has also organized the establishments of the Dhammarekkhita Buddhist Monastery in Fort Wayne, Indiana . and the Taung Pulu Monastery in Bolder Creek, California. He has extensively travelled to Europe, Japan, Cambodia, Laos, and Thailand, spreading Buddhism. He has achieved Associates Degree (AA) in general studies and arts from Truman College of Chicago, Illinois USA. He was honored with the Aggamahapandita Title by the Burmese Buddhist Council in Myanmar on January 4th 2005. 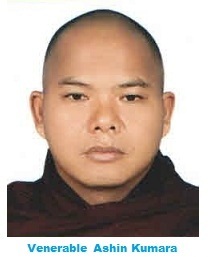 Venerable Ashin Kumara was born in November 22, 1976 at "Tesu Village" located in Wundwin Township, Meikhtila District, Mandalay Division, Myanmar. His name was Tin Soe, the second son of U Kyaw Thaung and Daw Byar Gyi. He was ordained to be a young “novice” at his village in March 17, 1987 with the name “Kumara” under the supervision of Venerable Sayadaw “U Mandala” who was a disciple of the Most Venerable “Taung Pulu Sayadaw Phyra”. He was later ordained to be a "monk" in April 25, 1996 at "Tesu Village" by Venerable Sayadaw "U Pyannya Jota" with the same name Ashin Kumara. Ashin Kumara studied Buddhist Scriptures at (a) Koe Taung Pyae Monastic School, Thae Taw City, (b) Kine Kon Pali University, Kha Yan City and (c) Pyinsa Nikarya Sassana Bimun Monastic School, Yankin, Yangon. From these Buddhist Institutions, Ashin Kumara studied "Dhamma Sariya" courses. The names of his famous teachers in Myanmar included (i) Venerable Sayadaw Ashin U Mandala, Laythar Monastery, Tesu Village, (ii) Venerable Sayadaw Ashin U Pyannya Jota (Egga Maha Gan Hta Wa Saka Pannitta) (iii) Ashin U Tay Za Ni Ya (Ganda Wa Saka Pannitta) (iv) Venerable Ashin U Kaylar Tha (Egga Maha Pannitta), Ashin U Thaw Bi Ta and Ashin U Zaw Ti Ka of Kha Yan, Kine Gone and (v) Ashin U Tay Zaw Bar Tha (Egga Maha Pannitta) of Pyin Sa Ni Kaya Buddha Sassana Monastery. Venerable Ashin Kumara practiced "Samahta" and "Vipassana" Meditations at various Buddhist Institutions in Myanmar. He is a resident monk at BBA.